In a word: Mermaid + Madison should make a Splash. Mayor Dave ate the Schenk's Corners sandwich with a coffee and an OJ. JM ate the Classic sandwich with a lemonade. Nichole ate the Schenk's Corners sandwich with a coffee. 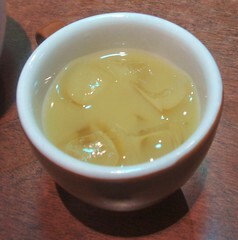 We were comped a round of ginger juice. The bill was about $24, or $8/person (thanks, Mayor Dave!). JM gave Mermaid Cafe a B+; Nichole gave Mermaid Cafe an A- (see our grading rubric). While Madison's sirens are more likely to hail from the nearby fire station, Mermaid Cafe offers a siren's call to anyone who appreciates all of the little things that make an eating place great. The only rocks you have to fear are your own inability to step outside your comfort zone. We ordered up our breakfast sandwiches and beverages. The coffee here is good and strong, and refills are cheap. The food seemed to come out to us fast, but we weren't really watching the clock. 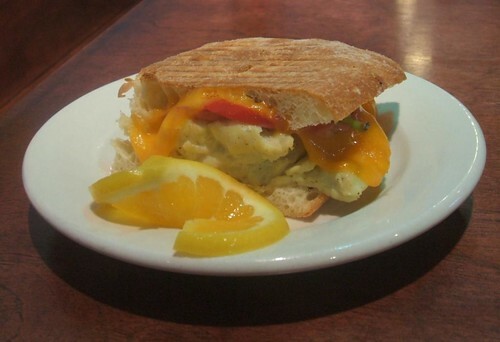 The Schenk's Corners sandwiches included a lightly scrambled egg, a slice of cheddar, red onion, and red pepper pressed on focaccia. Dave had the presence of mind to scare up some Tabasco, which brought out some flavor. 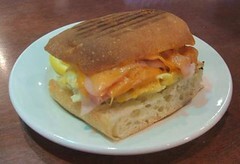 JM chose the Classic breakfast sandwich with ham and cheddar (his ham & cheese #38 for those who are still counting). Bacon, Swiss and provolone were also options. He figured the sandwich could have benefited from some sort of sauce as well, though hot sauce was out of the question for him (we didn't think to slop on the honey that was on hand at the beverage condiment bar). Funky, eclectic, neighborhood-friendly, socially progressive East Side restaurant could double as a neighborhood center. But the food could use a little more revolutionary zeal and the fresh-squeezed OJ is too chewy. Just before we left, the Mermaid's owner stopped by to give us a round of a house specialty, ginger juice, which she set before us saying "Drink this and you'll never be sick again." Made from an African recipe that calls for a pound of hand-grated fresh ginger per gallon, plus citrus and vanilla, it's so popular with the staff that a batch rarely makes it out to the floor. And rightly so - just a sip of the warming yet smooth concoction made JM speak in tongues, while (bonus guest!) Angela and Nichole drained theirs to the dregs. The lunch sandwiches have gotten raves elsewhere online, and Mermaid's staff are willing to make one for you anytime. The turkey, we hear, is a favorite with cabbies getting off the graveyard shift. All the bakery is made in-house, and other innovative drinks such as the "mermade" (lemonade plus pomegranate) called out to us. We may not have experienced the apogee of that which the Mermaid Cafe was attempting, but we do feel that we saw a glimpse of the aptitude that this place could attain. I really liked Mermaid when I was in the neighborhood. Quietest cafe in the area, decent sandwiches (nothing fancy, but still well-put-together), 3 minutes' walk. Perfect in the winter. I double agree with this review. This is a pleasant place with amusing and fun people who make unusually fine sandwiches. I wish I lived closer. I work across the street from The Mermaid. Their potato soup with a Mermaid Lunch is one of my favorite meals. I live nearby and have been in a couple of times. The first time, they were raving about their iced coffee and the special process they use to make it. I'll never order it again. The second time I ordered a sandwich to go...it was okay, but nothing to pull me back. But that ginger juice you mention??? That I must try! mermaid cafe is and event, try saturday mornings, you feel like your in a big city with the line the crowd the rush to get the sandwich. make it part of your day and you won't regret it. LOVE Mermaid Cafe. Homemade pumpkin muffins are great. The breakfast sandwich that is the last one on the board (can't remember the name-- has pesto and is on earthy multigrain wheat) is outstanding. I agree that the 'classic' is a bit dull. They also have a well chosen, small selection of kids toys for playing-while-you-wait. It is obvious someone (Lisa, the owner, I believe) has put some thought into it being pleasant for multiple generations. AND they have Malts and Shakes. AND the bathroom is clean, warm and has good looking subway tile. The Bahn Mi sandwich is incredible! Soups are tangy to spicy hot. Coffee is always excellent. Great casual feeling and friendly staff.